As one of the LANCE Elements, NASA's Goddard Earth Sciences Data and Information Services Center (GES DISC) provides Atmospheric Infrared Sounder (AIRS) Level 1 and Level 2 and selected Microwave Limb Sounder (MLS) Level 2 near real-time (NRT) products. On average, these products are available within 2 hours of observation time. 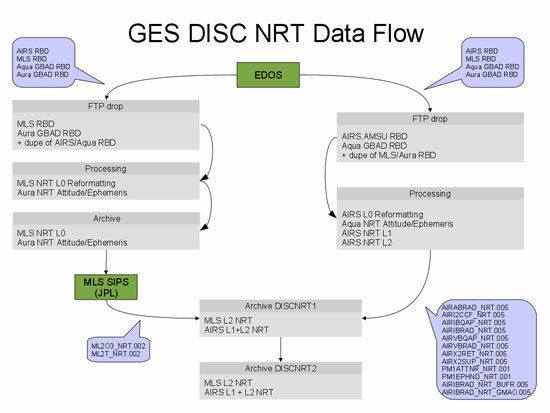 AIRS NRT data is processed and distributed by the LANCE AIRS element at GES DISC. MLS NRT data are processed by the MLS SIPS at JPL and distributed by the LANCE MLS element at GES DISC. NRT data from both AIRS and MLS , a 7-day rolling archive and provided on a best effort basis. The user services provided are subscription (FTP pull and push) and anonymous FTP pull. The system is supported during normal working hours but is monitored for system failures and unexpected data outages. The LANCE Aqua AIRS and Aura MLS NRT processing at GES DISC has redundancy in critical components: There is a duplication of the flow of the input rate-buffered instrument data that are inputs to Aqua AIRS and Aura MLS NRT processing – the raw data are routed to redundant archive servers so that if one or the other are unavailable, the flow is still maintained; the servers which process the raw data are themselves configured with hot-spare backups which can be brought on-line to take over for a loss of the primary processing server; and, the output Aqua AIRS and Aura MLS NRT data products are archived on redundant servers (discnrt1 and discnrt2). 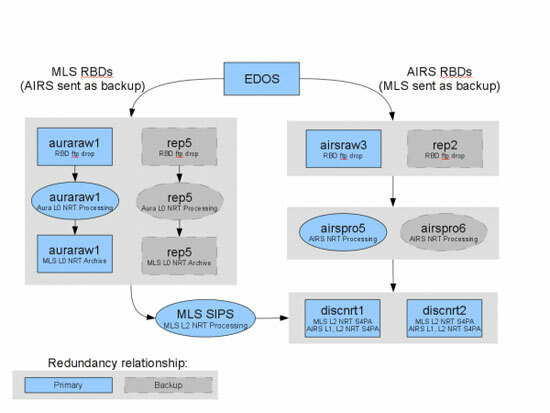 The diagram above shows simple architecture of GES DISC’s AIRS and MLS near real-time systems. Starting with the delivery of Algorithm Version 4 in 2005, AIRS Instrument Team began to produce two types of retrievals due to the failure of HSB on February 5, 2003. Data types that encompass retrievals using HSB data will have “H” letter in the short name of the data type, e.g. AIRH2RET. Retrievals without HSB have the familiar names, e.g. AIRX2RET. Documentation is associated with the Version of the Algorithm, which is embedded in the data filenames. Data are organized and stored as Collections at GES DISC. Collections are different from the Algorithm Version until Version 5 where data version became the same as the collection. Our search engines will naturally show Collections. Because reprocessing earlier data takes time and multiple months are scheduled concurrently, Collections generated by the previous Algorithm Version will necessarily coexist for a period of time along with Collections generated by the current Algorithm Version. Users are cautioned to double-check the Collection before downloading to ensure the data are those desired.